It seems the hardest part to start creating your video is, well, to start creating your video. Where do you actually start? Having a solid structure helps you focus on the actual content and ensures you have all the necessary elements in the right places to be effective. And it can be as simple as A,B,C. with D, E, F, too. So let’s get down to the most important part of any video. It’s not the content, nor the Call to Action. It’s the beginning of the video because if they ain’t watching the start – they ain’t watch any of it. And that includes the your great content and offer at the end. We need to grab the viewer’s attention within the first 3 to 5 seconds or they’re gone. And we can do that by using the basic Universal Laws. We Humans are hardwired to recognize movement. Our very survival depended on it. After all, any movement in the forest could be from something that wanted to eat us. So that is the first clue in grabbing the attention of our audience – movement. Even a talking head video can have movement through facial expression and hand gesture. So focus on visual movement right from the very start. The second Universal Law is that we notice contrast. When we look at a picture, we quickly notice what stands out as being different. For example if there were one hundred red balls and one white ball, we would instantly be drawn to that one white ball. We can’t help not too – again it’s hard-wired in our brains. So the start of our video has to look different to all the other content that is in the newsfeed to compete for attention. You could use a black or green background in the video, use black and white images, or extreme close-ups. Just be creative. The third Universal Law is that we focus on what is new or unknown to us. For example we may see an image consisting of a room with a lounge chair, coffee table, a television and curtains. We would quickly surmise that it is a lounge room in a home and you would move on to look for a new image. If however you noticed a cow in the room, you would do a double take and pay more attention to the image. The unexpected cow in the lounge room needs some explanation so we will spend more time searching for clues. So the third clue to grab attention for the start of our video, is to make it unusual and have your viewers ask questions. With each of these tactics, we need to make sure that they are relevant to the rest of the video and not just a type of ‘bait ‘n switch’ trick or you will lose your viewers for good. Once we have gained our viewers’ attention, we need to quickly articulate what they will gain from watching our video. Now is NOT the time to talk about you or your products – focus on their outcomes. For example you might say that by the end of this video, you will know how to play the 8 major chords for the guitar. Obviously if they want to learn how to play the guitar, then they will be interested in watching the rest of the video. Another example might be a chiropractor who promises to show you how to instantly relieve your lower back pain in five minutes. Obviously if you suffer from lower back pain, then you will feel compelled to watch the rest of the video. Always think about the journey your viewer will take. Where are they now, before watching your video and where will they be by the end. The Content is the meat in the sandwich. This is where you deliver the stuff that they want to solve their problem. Always strive to give great value rather than promising that you will later (when they buy from you). They will judge your product offer based on this content so don’t hold anything back. This uses the rule of reciprocity – give them something of value and they will want to return the favour. In most cases, the content you provide is already out there on the internet in some shape or form. Your job is to interpret that raw information and shape it with your own experience and deliver it in an effective way. 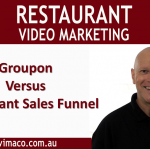 There could be a dozen videos on the same topic, covering the exact same points but the winning video will be the one that presents its ideas in a more compelling manner. Break down the information into bite-sized chunks of no more than seven segments. The objective is to get your viewers to take the action you prescribe in your video. If they don’t take action, then they will not consider your content as being valuable – which means they will not take up your offer. Once your audience goes through your content, you want to motivate them to use it. Once again you focus on the outcomes they will benefit from when taking action. The results should be about the emotional state they will be in. For example, your content may have shown them how reach their ideal weight in six weeks. So their initial emotional state might be a lack of confidence in their body shape but by the end of the program, they will feel greater confidence within themselves. Remember that most of our decisions are based on emotions that are justified intellectually. Ok so you have delivered compelling content and created desire for your audience to take action – but will it work for them? Using simple testimonials from people just like themselves, is a highly effective way to nudge your viewers to take action. For B2B markets, case studies from businesses in the same target group works just as well. Simply present the results achieved to show that it can work your audience. Evidence is based on facts and logic that cannot be denied. You’ve made a great video – so be sure to finish strongly. Where do you want them to go from here? Ask them to subscribe to your community, share your video, visit your website or optin for more information. So tell them exactly what to do next. Now you have the ‘A,B,C,D,E,F’ template for structuring just about any video. No more excuses for not getting your next video campaign up and running.